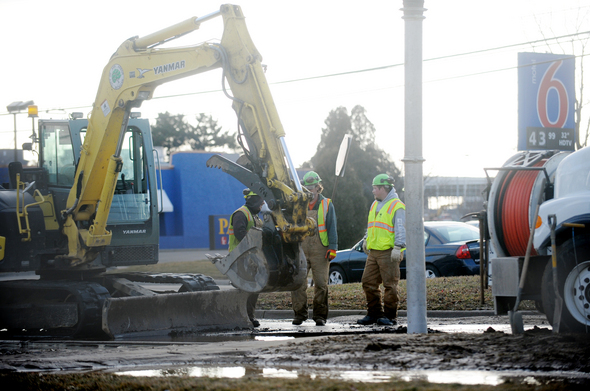 Posted on Thu, Feb 2, 2012 : 3:46 p.m.
Workers at the scene of a water main break on South State Street near Ellsworth Road in Ann Arbor Thursday. 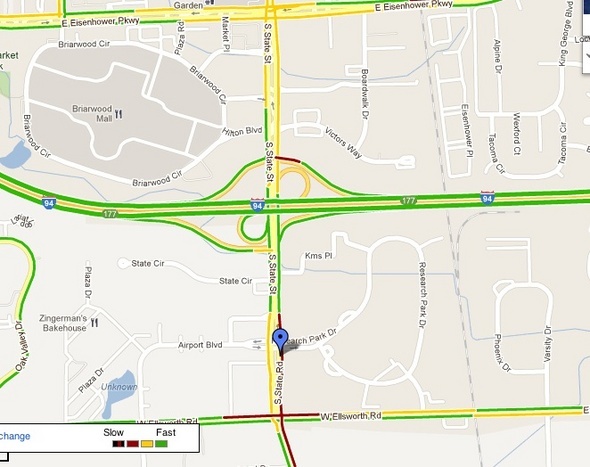 Northbound State Street has been closed at Ellsworth Road on the south side of Ann Arbor as the result of a water main break, blocking access to Interstate 94 from the south. Southbound lanes remain open. Ann Arbor Police Lt. Angella Abrams said the street is expected to be closed for several hours while the main is repaired. She said there was a significant amount of water across the street. A contractor working in the area hit a 16-inch water main, breaking it, said Joanna E. Satterlee with the city's Communications Office. Water service has also been disrupted in the area from Research Park Drive to Hilton Boulevard, an advisory from the City of Ann Arbor said. The break occurred about 3 p.m. Thursday. Traffic congestion in the area of the water main break is shown in yellow and red on the map. Fri, Feb 3, 2012 : 6:02 a.m.
Fri, Feb 3, 2012 : 2:52 a.m.
No boil water advisory? I live nearby and my water was literally so brown when I got home from work that I checked the news for a water main break. Fri, Feb 3, 2012 : 2:49 a.m.
Thu, Feb 2, 2012 : 10:51 p.m.
AA.com - did the contractor contact Miss Dig prior to digging? Fri, Feb 3, 2012 : 12:04 a.m.
Thu, Feb 2, 2012 : 9:31 p.m.
Ok, there is a water min break. The headline in the new format of Mlive says they are investigating a report of a water main break. Thu, Feb 2, 2012 : 9:43 p.m.
Thu, Feb 2, 2012 : 9:32 p.m.
That should read main not min.